The number of users of social alarms connected to wireline networks, such as Aerotel's GeoSkeeper, has already reached some 5 million people in Europe and North America, according to a report published by research company Berg Insight. “The addressable market for the next generation mobile social alarms is large as seniors are becoming increasingly active”, said André Malm, senior analyst at Berg Insight. "The design of mobile telecare devices is very important since the wearer should not feel embarrassed by having a device that can be perceived as age-defining". A report published last month by Global Industry Analysts predicts that the global market for social alarms will exceed $2.7 billion by 2018. 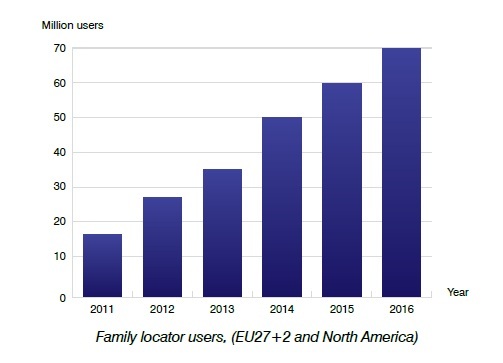 Berg analysts forecast that the overall number of active users of family locator services, of all sorts, in Europe and North America will reach 70 million in 2016, compared to only 16 million in 2011, growing at a compound annual growth rate (CAGR) of 34 percent. The report notes that family locator services is the largest segment for people monitoring and safety solutions based on either GPS-enabled smartphones or dedicated cellular/GPS location devices.